A well-maintained lawn helps showcase your home’s beauty. 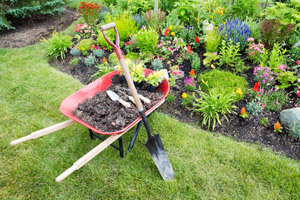 However, remembering basic yard safety also helps to keep your children and pets healthy and safe. To finish off our summer series on children’s backyard safety, we are reminding you of important do’s and don’ts when it comes to garden and lawn maintenance. DO supervise children at all times. We have mentioned this in all of our yard safety blogs because we cannot stress it enough. While supervision alone does not guarantee safety, it does allow you to identify and respond to danger more quickly. DON’T allow children or pets to be outside while you are mowing the lawn or using other potentially dangerous power equipment. This includes weed whackers, pressure washers and tractors. DO check your yard for poisonous plants. Many popular plants for around the home and in the garden are actually poisonous to your children and/or your pets. DON’T leave tools or garden chemicals out in the open where pets or children could find them. DO store them in a locked shed or garage when not in use. In addition, check to make sure any pesticides you use aren’t harmful to your family pet. DO clean any chemical spills immediately. DON’T leave ladders unattended. Your child could climb them and risk falling. DO check your yard for rocks or other objects capable of becoming projectiles if your mower comes in contact with them. Even small objects could become dangerous due to the velocity at which they can travel. DON’T leave buckets outside. If filled with rainwater, buckets can become dangerous to young children. Children can drown in water as low as a few inches. To prevent this, store buckets upside down and away when not in use. DO secure birdbaths and lawn ornaments. Heavy statues can still be overturned and possibly harm your child. Also, remember to regularly change birdbath water and clean garden statues to prevent mosquitos, mold and other pests from developing. DO routinely check dog runs and clothing lines for damage. If these become too loose, they can become tripping hazards. DO properly store garden hoses. These, too, can be trip hazards. We hope that our summer series on backyard safety has allowed you and your family to enjoy the warm weather and to remain safe. Yet, we do know that accidents can happen at any time. If you or a loved one has been injured due to the carelessness of a property owner, contact an experienced attorney to discuss your options. Contact KBG for Results You Deserve®.